in april of 2017, i had to say goodbye to my little, beloved old car. she, Mabel to her close friends, treated me well. i had the option of buying a new vehicle, but knowing i needed to save for the incredible five-week trip i’m currently on in europe, i opted against shelling out a huge chunk of money on a car. while i still think i made the right decision (this trip is what dreams are made of) it was no secret that i felt pretty lost without my own vehicle. while i navigated the public transit system in calgary like a pro, it’s no replacement for the freedom of being able to get behind the wheel any time to go any place. i was limited and on someone else’s schedule: two things i dislike. thankfully, i’ve been friends with Ford Canada for years now. with an ever-changing lineup of new vehicles, i’ve slid behind the wheel of some of the newest cars and SUVs, loaded with all the bells and whistles. it’s an incredible luxury for me, knowing the bus and 17-year-old-car were what i was comparing it to. 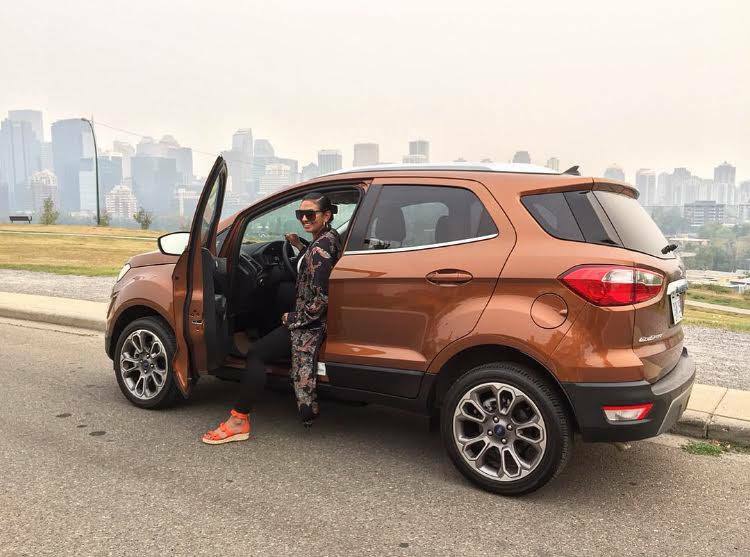 in august, i got to take the 2018 Ford EcoSport for a week, and it allowed me to do a few of my favourite calgary and area things, on my own time. the first day i got the EcoSport, Jess and i took it for a spin in the city. our original plans were to go to Hayden Block for dinner – some of the best barbecue outside of the southern US – but when you have a new SUV crossover at your disposal, you need to make more plans that include driving. after dinner, we drove to Made by Marcus for ice cream, then to the crescent heights lookout for a (very smoky) view, and finally to chinatown to stalk out some graffiti i had been trying to find for a while. Jess played DJ since she has incredible taste in music, and having SiriusXM made it that much easier because we didn’t have to navigate around commercial breaks. we basically jammed to 90s R&B and hip-hop; is there anything better? the compact nature of the EcoSport made it so simple to park all over the city, and i never had to worry about parallel parking it, due to the backup camera and thinner body. 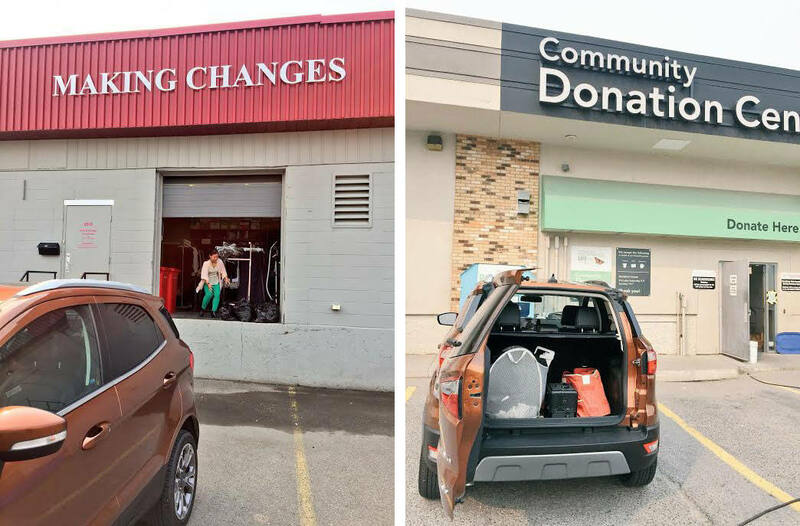 having the EcoSport gave me the ability to donate clothing and home goods to a few charities around the city. i had been wanting to donate to Making Changes Association for a few years now, but never seems to have enough to make a contribution i saw as worthy – now, i know even one thing helps. Making Changes is a vibrant organization that provides relevant programs and services to empower women in transition, giving them confidence as they establish themselves in their communities, among their peers, neighbours, and a new life. 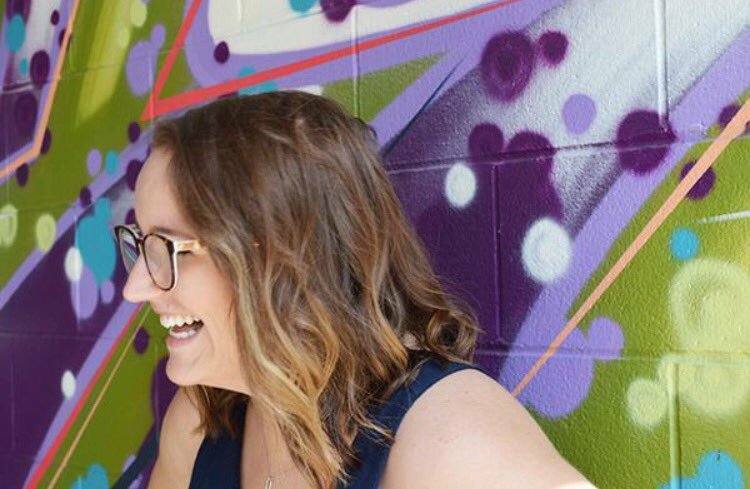 their Walk-In Closet provides women with a selection of work attire for their transition into the workplace and My Best Friend’s Closet provides teenage girls from low-income homes (ages 12-18) with a broad selection of fashionable and functional clothing to meet their school and recreational needs. my dresses, blouses, jeans, purses, lulus, heels, and accessories are now in much better homes, being used and appreciated by women across calgary. the EcoSport’s trunk fit over six bags of clothing, and the unique swing gate with hideaway latch swings out like a regular car door for an added touch of style. it made the truck simple to open and close, too. my 5’5-self didn’t have to reach up on my tippy toes to try and close a back hatch. if i’m out on a joyride, you’ll find me in the mountains. 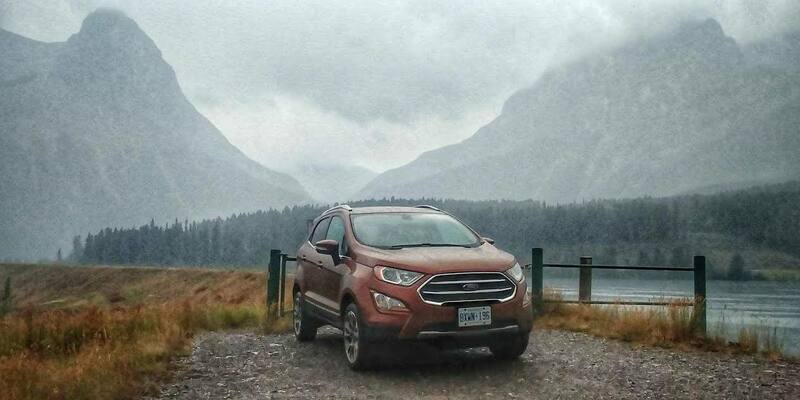 in the week that i had the Ford Canada EcoSport, i was out in the rockies twice. the smoky haze of the wildfires and rain kept many tourists away, and gave Aaron and i the opportunity to search for the most picturesque backdrops. we pulled over a few times along the winding mountain roads to play in the rain and snap photos. the heated front seats took the chill out of us – enough so we could go get ice cream! let’s be honest, it would have never been too cold for ice cream. i was sad to hand the keys back. small in size but big in capability, the Ford EcoSport was an SUV i could see myself driving longterm. 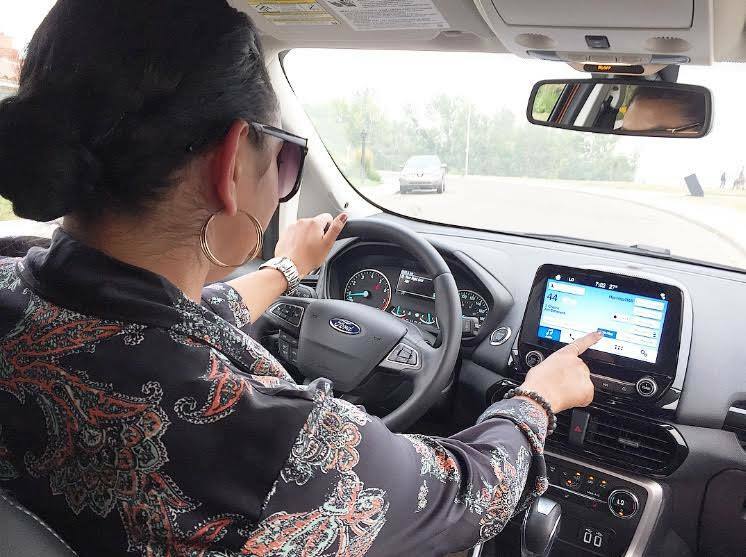 this post was written in partnership with Ford Canada. Previous Post autumn in europe. Next Post oh hello, october.